In March, 2004 the Class completed it’s Class Gift Project by executing two documents shown in the sub-pages below. 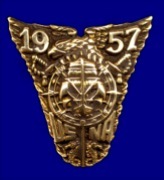 The first was an agreement to make a Charitable Gift to the United States Naval Academy Foundation for the purpose of creating and supporting the Class of 1957 Chair in Naval Heritage. The second was a Memorandum of Understanding between the Class and the Foundation that defines the manner in which the Class Gift will be managed. Both documents are published in their entireties in the sub-pages next under. The documents provide for regular reports on the activities of the occupant of the Class of 1957 Chair in Naval Heritage. The current report is provided on this Web Site on the Heritage Chair Today page.